"What is RSS?" This was number five on the top-ten list of "What is" questions asked at Google, according to their Zeitgeist list for 2008. For years, and to this day, RSS is lauded by some as an effective content promotion and marketing tool for publishers. It's also the poster child of a good idea gone wrong. There's no doubt that, as a publisher - and used properly - RSS can distribute your content to many corners of the Web, and even help with your basic SEO efforts. Yet, for the majority of consumers RSS has yet to gain a foothold in their daily Web use. 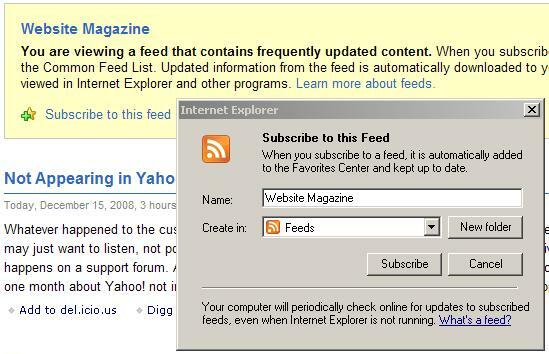 According to a 2008 Forrester study, just 11% of more than 2,000 adults surveyed used RSS feeds. Website Magazine's own email subscribers far outweighs our RSS subscribers - and ours is a tech savvy audience. Why? Is it our failure as marketers? Is it RSS's failure as a platform? The answer is a little bit of both. This example does give options. But unless your reader already has an account with one of these services (MyYahoo, Pageflakes, etc. ), they will be forced to go through yet another round of clicks, read explanations and possibly sign up for another service. And we all know that more clicks, and forced registration results in a higher rate of site abandonment. But there's an interaction that takes place even before this - the fancy RSS button, first seen in Mozilla's Firefox browser. Ask any group of average Web users what that icon means and chances are the majority either don't know or think it's a way to turn up the website's volume. There are many sites out there that simply feature the icon as a way for users to subscribe, without any explanation as to what it means. Which brings us to another critical issue - RSS promotion and education. The idea encompasses the process getting users to sign up, relying on an ambiguous icon and the language we use to promote our feeds. Most often next to an RSS icon, you'll see something like, "RSS," "abc.com's RSS Feed," "Sign up in your Reader," or "Subscribe." The consumer thinks, What's RSS? What's a feed? What's a reader? Subscribe? As marketers, we have failed. We did not get the message across, we confused our consumers and we made it difficult for users to take our content with them throughout their Web travels. RSS has failed. As far as the consumer is concerned, RSS never existed. But there is hope. The technology is still important, and can still be a highly effective way for users and publishers to view and share content. But this time, it's up to developers and marketers. I came across a site that helps illustrate my point. Notifixio.us is an RSS service that will notify you every time your chosen feed updates. 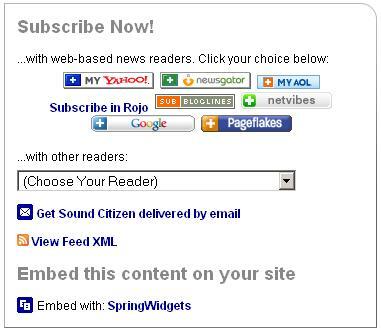 There are many features here that separate it from the average RSS readers. There are also several mashups available, including one for Technorati, where you can choose to be alerted when your chosen keywords (company name) show up in the blogosphere. But for our purposes, let's focus on their widget. You'll notice that, on the surface, there's nothing remarkable about it. In fact, the presentation could be better. However, there are a couple of very important features here. First, take a look at the drop-down menu. 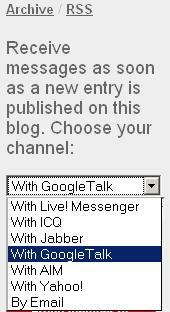 You see options to receive updates with GoogleTalk, AIM, Yahoo!, email and others. Instant messengers are used by more Web users than RSS and everyone on the Web uses email. It's up to developers to make RSS signup an easier process, to facilitate delivery of feeds wherever and whenever the user desires. Now look at the wording above the drop-down menu: "Receive messages as soon as a new entry is published on this blog ..." The message is direct. It tells you what you can expect and where it's coming from. More important, the consumer is electing to "receive messages," not subscribe or sign up. It's subtle, but important. When a user is asked to sign up or subscribe, questions emerge. Am I paying for this? What exactly am I signing up for? Will I need to fill out a form? Will I get a bunch of unwanted mail? It's up to marketers and publishers to interpret RSS for our readers and consumers, to make it absolutely clear the results of taking this specific action. Now, this widget is clearly not perfect - in fact when the drop-down disappears, there's a big "subsribe" button. But it's a good start. RSS has its uses and should not be abandoned altogether. There are SEO benefits - as a publisher, RSS can still be an effective way to spread content, and have your content shared and linked to by other publisherse. But when it comes to users, the focus should be on effectively marketing email subscriptions, or enticing users to "receive updates." Users know what they're getting in email. They know how it works. Email is also accessible. There's no separate service to sign up with, no new websites to bookmark and no user names or passwords to remember. Users open their email every day and many keep it open all day long. They get email on their phones and other mobile devices. They know how to open an email, and how to delete it. As a publisher, you get added benefits. You can control your rate of delivery, you have a direct channel to communicate and if you use a good service, you have reliable metrics on how, when and if your messages are received, how much of your message was read and how users interacted within your email. We're going to make some changes to our RSS feeds and how we present them around here, as well as put some more effort in our email marketing efforts. And we want to know: How do you use RSS? Do your readers use your feeds? Leave us a comment below. And if you decide to make a change, to alter your delivery methods or the way you ask for users to subscribe, let us know how it goes. We would love to share your experiences with all 120,000 of our subscribers. Send us an email.